Go Visit Hawaii: We’re on the market for a new point and shoot digital camera for our Hawaii vacation, any suggestions? Natalie Norton: I’ve got a doosie for you. It’s not necessarily what I’d recommend to everyone for everything mind you, but for a family vacation in Hawaii this one rocks the chart! Anything in the Olympus Stylus family (my point and shoot beach baby is the Stylus 790 SW: and she’s a beaut!). This little angel is digital, WATERPROOF, and shockproof up to 5 feet. So you can get great snorkeling shots and then step up onto the beach and also get a great shot of your two year old throwing sand in grandma’s eyes. It’s got all sorts of fun, simple settings. It’s a great size, totally durable (I’ve dropped mine off of a moving horse and buggy before onto the pavement. . . don’t ask. . . and it came back unscathed). It’s not even ultra expensive, you can find them at BestBuy (online or in the store) for a little over $200. You may want to order a floating strap at the same time, because though it is magical in many ways, the Stylus has not yet learned to swim and you’d hate to have to leave her on the bottom of the ocean. In the end, don’t get sucked into worrying too much about Megapixels. Anything around 6 Megapixels is going to give you great shots (even at larger sizes). 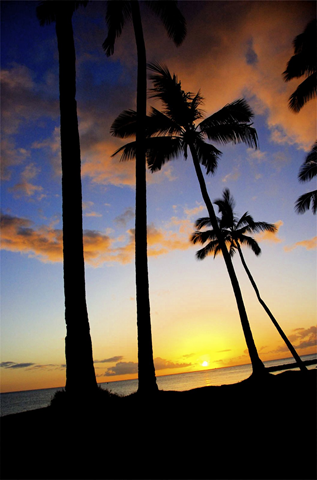 Go Visit Hawaii: What tips do you have for looking your best in your Hawaii vacation photos? Turn on a slight angle. It’s more flattering to the physique. . . but don’t go crazy or you’ll look like your posing. . . that’s not good either. Try not to shoot photos of your loved ones in sun that’s directly overhead. The angle of the sun will produce unflattering shadows. Step into the shade and take advantage of overcast days. Honestly, I can’t think of a better time to opt for a photo shoot than on a Hawaii vacation. . .you’re living this remarkable memory, you’re relaxed as can be, your cheeks have been kissed by the sun. . . yum. All of it. Go Visit Hawaii: Where are some of the best spots on Oahu for photography? Natalie Norton: Ha ha! I tell you what, it’s so paradisiacal here I think you could get good shots before even leaving the Honolulu Airport. For landscape photography, look for contrast of colors and simplicity of subject. As I mentioned in yesterday’s interview, Pounders Beach near Laie on Oahu is a perfect example of contrast and simplicity. At Pounders, you have the contrast of the black lava rock against light colored sand, the deep blue water and the Ko’olau Mountain Range in the distance. You’re going to find a million opportunities for good landscape shots all over Hawaii, but I’d say, the Hoomaluhia Botanical Garden on Oahu would be a great bet. It always amazes me when I go there, because it’s miraculous if I run into a dozen people. It’s so mellow. That’s great, because your beautiful shot of the ducks floating peacefully on the lake with the mountains rising majestically in the background will be spoiled if it’s also got a kindergarten class field trip walking through the frame. I’d say you really can’t go wrong with the sunset over the water on any beach, anywhere on the island. Two suggestions of great places to watch and shoot the sunset are Sunset Beach and Turtle Bay Resort, both are on the North Shore of Oahu. Sunset shots are surprisingly easy to take. They always seem to turn out great! Turn off your flash for those and make sure the horizon is off center, either in the top 3rd or bottom 3rd of the frame. Go Visit Hawaii: What tips do you have for taking those “wow” photos of children on vacation? Natalie Norton: Get down. I often lie on my belly to shoot kiddos–eye level is a good way to gage. Don’t be afraid to get up close either by zooming in or physically walking closer to your child. I really really really REALLY try never to say “Smile!” or “Say Cheese” etc. A forced smile on your little angle is like cow manure (pardon my French) compared to their genuine array of expressions. Also, sneak up if you can. Candid shots of little ones are just priceless. They capture those real, treasured moments that are so fleeting in the lives of our children. These little munchkins grow up so fast. Final word = be patient and SHOOT SHOOT SHOOT! Rather than getting one nice posed picture of your child’s “picture face,” get him/her laughing and then click 10 frames as fast as you can. . . chances are one of them is BOUND to be a real doosie! Natalie Norton lives and shoots on the North Shore of Oahu with her husband Richie and her 3 sons, Raleigh (4), Cardon (2), and Lincoln (18 months). To view a sample of her work or to book a session, visit www.natalienortonphoto.blogspot.com. Photo credits to Natalie Norton. Thanks again Sheila! Go Visit Hawaii is a pearl! Thank you, Natalie, for sharing your expert advice so openly! You rock! Thanks for the tips Natalie. I recently bought a Nikon DSLR and can’t wait to get back to Hawaii to take some photos. I agree with your suggestion for the waterproof camera. We have a Pentax that is waterproof and it’s great to be able to take it snorkeling. I especially like the tip about the floating strap! I love Natalies photos! I love reading what she has to say too. So clear as if she is talking to me. Makes me smile. Love the tips and i will for sure stay away from “cow manure” shots hahaha. Cracked me up. Aloha and thanks for the good read guys. Hi Jake – I’m so glad you enjoyed the Q&A with Natalie. Some Q&A’s can be a bit boring, but Natalie really answered questions if a fun and fresh way! She rocks!